MIDImplant is a special circuit needed when you want to control your older analog synthesiser with MIDI. You can use this little board if your synth works with V/oct or Hz/V control. It takes about 2 seconds (or 4 keystrokes) to switch between V/oc and Hz/V ratios. It's calibrated at 1V/oct, but any ratio is possible, from 0 to over 2V/oct. Hz/V are available in 5 flavours, covering from 1 up to 5 octaves. Basic soldering skills are needed as well as a bit of knowledge about your synth. The service manual of your instrument, or at least schematic is most helpful. Both CV outputs are monophonic, that means each of them can control one oscillator. They use last/top note priority. It means that whatever new note was played, it's immediately converted into proper voltage, regardless of the keyboard state before hitting the new key (if there were other keys pressed or not). If some of pressed keys are then released, CV output changes to represent the highest remaining note currently played on the keyboard. If the last key is released, CV remains at the level as before the release. Although this description may not seem obvious, described mode of operation is probably the most intuitive way of controlling pitch for monophonic analog synths. MIDI notes with velocity. One input represents pitch, the other one velocity, while GATE1 controls note duration. MIDI notes on 2 different channels. Each Gate output works together with paired CV output. Any of 120 available MIDI Continuous Controller, e.g. volume, modulation, etc. Both outputs can work independently, that means one can be notes, the other - velocity. Or both can represent pitch of notes on different channels. Or one can be Pitchbender, and the other one - modulation. Combinations are endless. Each MIDImplant is individualy calibrated to match parameters listed above. The calibration process is performed using laboratory 6.5-digit multimeter with base accuracy of 0.0035%. 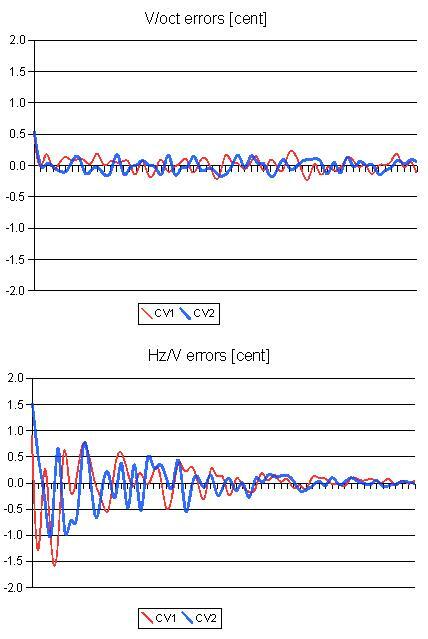 As final check, voltages for all 61 notes in both channels and in both modes (1V/oct and Hz/V) are measured again. All those 244 measurements are supplied to end user together with MIDImplant module. Calibration is performed at 15V power supply and 100k load at CV. Below is example graph for randomly selected MIDImplant. Horizontal axis range is 5 octaves. In order to install this device you need to find some key points inside your to-be-MIDIfied instrument: power supply rail (between 6 and 15V), ground (0V), and control voltage (CV+GATE) inputs. Most important is Voltage Control pitch input of your synth oscillator, or a point in the circuit where you can add it (usually it takes just one resistor to have additional CV input). Another important voltage is GATE signal, that starts the envelope generator. GATE is active whenever a key is pressed on a keyboard, while CV input tells the instrument about the pitch to be played. 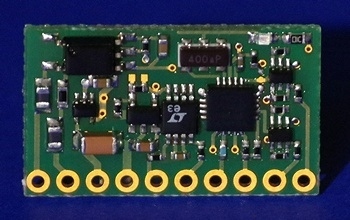 MIDImplant module provides 2 pairs of such signals. That means you can control 2 oscillators, or make just one oscillator MIDI controlled, together with other control like VCF cutoff frequency. Thanks to user friendly MIDI-learn function, you only need to press the EDIT button once, and generate the MIDI event you want to associate with CV output. For example to setup as note+velocity, press the EDIT button once, and play the lowest note on your MIDI keyboard. The module is ready to work with your keyboard since then. 2nd channel and tuning are also configurable via the same MIDI-learn button, see the manual for details. More settings is available via MIDI System-Exclusive messages. Use your browser to select desired parameters and create plain MIDI file, that can be played in any sequencer, or straight from the computer to MIDImplant in order to edit all user settings. Go to MIDImplant configurator to set up your unit. User settings are of course stored in nonvolatile memory, so you don't have to mount any button for setup. Just use a piece of wire connected to GND to activate edit mode during installation, any you will never need to change it again after you close the synth case.